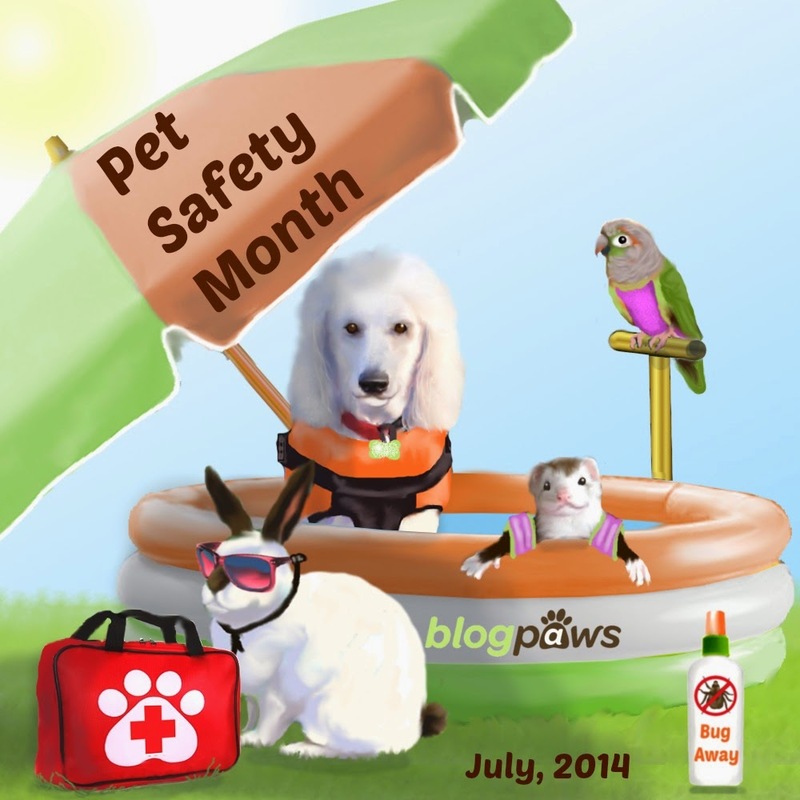 July is Pet Safety month. The summer months are always fun with outdoor activities, vacations, flowers blooming, swimming, and barbecues. While all of these things are meant to be enjoyed, they can pose a safety hazard to our pets. I asked Bentley and Pierre to do a public service announcement on things they feel are important to safety issues. I think that maybe I ought to have explained a bit more. 1. NEVER leave your pet in a parked car. The temperature in a car can rise to extremes in fifteen minutes. Don’t let a fun trip with your best friend turn into a tragedy. If you can’t keep your pet with you when getting out of the car, leave them at home. 2. Know which plants in your garden are potentially harmful. We posted a list of some common plants here. Herbicides, fertilizers, and insecticides all pose a threat. Check the label to make certain that you are using a non-lethal brand. 3. Always keep a close eye on your pet around water. Not all dogs are natural born swimmers. If your dog isn’t used to water, check into a swimming vest before inviting them in the pool. 4. Protect your dog or cat from ticks, fleas, and mosquitoes. Not only are they annoying, they can transmit many nasty diseases. We use Pet Naturals of Vermont Wipes and they work well for us. Whether you opt for the spot-on drops, the new Seresto collar, or an oral type, be sure that you mark on your calendar when it is time to renew their preventative. 5. Always give your pet their heartworm medication. This horrid killer is completely avoidable! 6. Make sure that your pet has proper identification with collars, tags, and a microchip. 7. Snake bites increase during the summer months. While it is difficult to keep them out of our yards, there are things that you can do to discourage them. Fences that are set a foot or two into the ground, cutting off the snake’s food supply and shelter, mowing closely around the house, storing firewood away from your home, removing junk piles, clearing our weeds and brush, and emptying standing water. If a snake bites your dog, seek immediate medical attention. 8. The smell of meat on the grill is as alluring to a dog as much as a human. 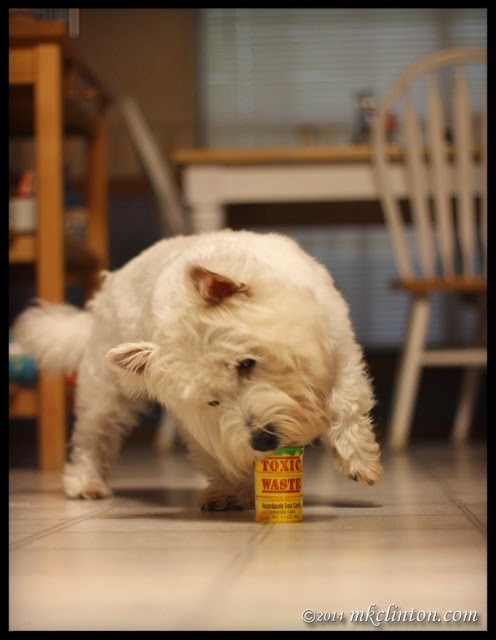 Don’t let your pup hop up on the barbecue pit and resist the temptation to feed them food that has seasonings or sauces. 9. Whenever your dog is outdoors, make sure that there is a shady spot for them to retreat. Excessive heat can lead to a heatstroke, so know the warning signs. Excessive panting or difficulty breathing, increased heart and respiratory rate, drooling, mild weakness, stupor, or a sudden collapse demand a quick response. If your pet displays any of these symptoms, they need to be cooled by dipping them in a tub of cool water for up to two minutes. Place the wet dog in front of a fan. Cool packs can be applied to the groin area and wipe their paws with cool water. When the body temperature lowers to 103˚, dry the dog and seek veterinarian assistance. 10. If the pavement is too hot for your feet, it is too hot for your dogs. Take your walks in the morning or evening when the ground isn’t as hot. You can also purchase paw covers to protect their pads. There are several on the market in a variety of styles and prices. Check online or at your favorite pet supply store. We are joining our friends from BlogPaws for Wordless Wednesday. Although we weren’t exactly wordless today, the tips are important to share with our readers. The boys and I wish everyone a safe and happy summer! · Don’t forget to enter our giveaway for your own bottle of Revitamal. Just click on the bottle in our sidebar. · If you are looking for great pet supplies (including the ones mentioned on today's post) at discounted prices, please visit Bentley’s Bargains at the bottom of today’s post. Dang it, Gramma! Why are you letting my baby play with Toxic Waste? Hahahaha too cute! Excellent list. It amazes me that we still have to remind people not to leave their dogs in the car. I am so crazy about my dogs' heart worm prevention. I've seen the horrors that come from heart worms and I never want to go through that with my two. These are great tips everyone should have! They seem obsessed with the scissors. Great tips. Thanks you Bentley & Pierre - I think your warnings are like pearls of wisdom and I hope everyone heeds them. 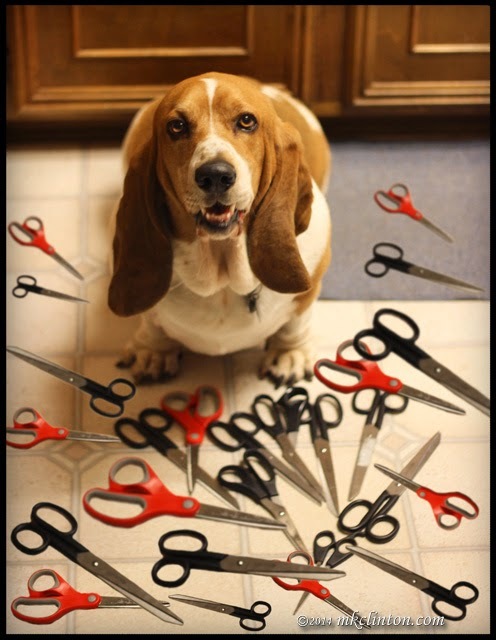 A wonderful list, and Bentley, it's a good thing you don't have opposable thumbs with all those scissors! Great post with wonderful tips! And no worries boys, we won't play with scissors and toxic waste!!! BOL! Snake bites! Just goes to show the differences in where we live - I never would've thought of that, but it good advice for those in climates with dangerous snakes! Here, the equivalent advice is to keep your dog on leash in bear country. Those are some excellent tips. I play with a lot of things that I shouldn't (think garbage cans, food containers, garbage cans...) but thankfully nothing too dangerous! We have rattlesnakes up at one of the parks and they always warn people to keep their pets on a leash and definitely on the path. Some peeps have been bitten too. You swell up and your face turns purple and you can die. Not a good look. Great tips, my friend! Great post. At first I wondered if you had some sort of scissor addiction! Took me a minute to realize they were photoshopping. Great shot! Those are the best PSAs I've seen in quite a while! The boys were just trying to keep it simple! LOL Those are all great tips. Around here we don't have to worry about snake bites, thank goodness, but everything else we do. Ha ha, I wondered who would own that many pairs of scissors....good job because you fooled me with the photoshopping! An awesome list of tips to remember and be wary of! Thanks for putting it together so nicely! Wow, those are some great reminders!! The Toxic Waste are those super sour candies. My son gave them to me and I just loved the container! haha! That's a great list, and I'm laughing over the toxic waste picture!